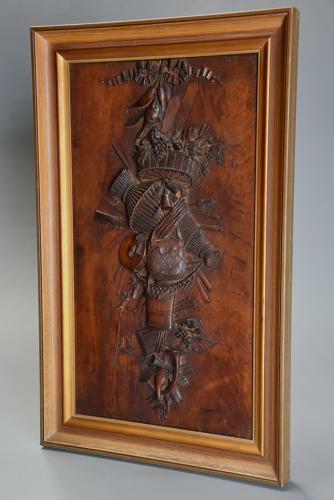 This superbly carved panel consists of various 'trophy' and hunting related articles such as a carved ribbon, fish, birds, finely carved basket of fruit, tassels and bells, fish basket, various hunting implements, oak leaves and acorns, a bag with superbly carved fringing and tassels, fishing net containing fish, fruit, grapes and vines and horn musical instruments. These types of carving were particularly fashionable in the mid-late 19th century, these being a excellent way of the exhibiting the quality of the wood carvers' work. This panel is in very good, original condition with some natural splitting (which can be seen on the images) but the panel remains stable, can go straight into a home or collection and would make a wonderful statement wall piece.